Hi, I'd like to show you this page I found on Furniture Barn's website. This contemporary styled cocktail table beautifully combines distressed woodwork with stoic metal framing and hardware. The contrasting natural elements give this piece a unique rustic charm. Sharp corners and flat edges are modern design attributes that add to the appeal of the table. The large bottom shelf is great place to store reading materials or a laptop computer while the two bottom drawers provide additional storage space. 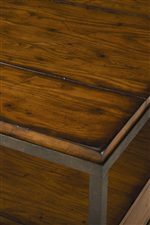 The Baja Rectangular Storage Cocktail Table by Hammary at Furniture Barn in the Pennsville, Bear, Newark, Hockessin, Middletown, New Castle, Townsend, Talleyville, Wilmington, Marshallton, Smyrna, Elkton, area. Product availability may vary. Contact us for the most current availability on this product. Warranty Manufacturer warrants products against defects in materials and workmanship for 1 year from the date of shipment by manufacturer. Warranty applies only to products used exclusively for personal, family, or household purposes by original purchaser. The striking fusion of distressed woodwork and stoic metal framing give the pieces in the Baja collection a strong visual appeal that is at once both rustic and very modern. Each piece has a unique understated design that allows it to effortlessly complement a wide range of home decors. Whether you are looking for a cocktail table, end table, etagere, or entertainment console, these pieces are sure to deepen and beautify the aesthetic of your living room or den. The Baja collection is a great option if you are looking for Industrial Contemporary furniture in the Pennsville, Bear, Newark, Hockessin, Middletown, New Castle, Townsend, Talleyville, Wilmington, Marshallton, Smyrna, Elkton, area. Browse other items in the Baja collection from Furniture Barn in the Pennsville, Bear, Newark, Hockessin, Middletown, New Castle, Townsend, Talleyville, Wilmington, Marshallton, Smyrna, Elkton, area.